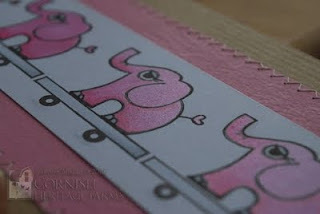 Ambrosia and Iron: Pink Elephants on Parade! Super girly and sweet! Love this shimmer and design Joanne! Oh how I love those Elephants on parade! 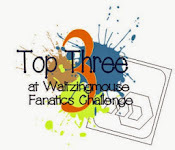 And I can't wait to try my hand at mixing watercolor pencils and Shimmerz! Great idea! Great card - you're right it would make a lovely new baby card. Bow all you need is the right baby! That's a gorgeous card again Joanne and, yes, it would be fab for a new baby card and tag. 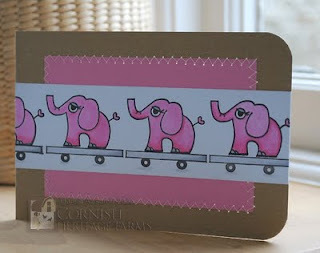 The shimmer is good ... but the stitching is great ... love elephants and I love this card!